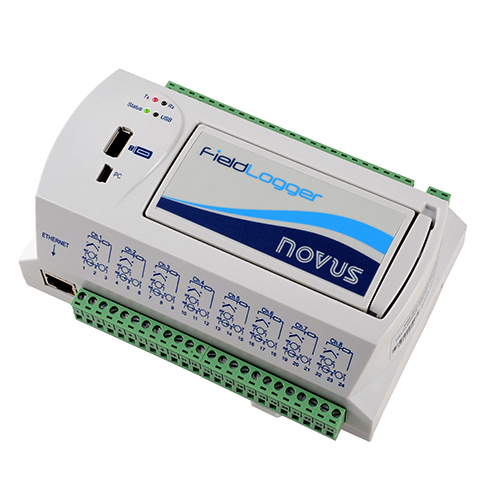 The FieldLogger 512k is a data acquisition system which has been designed for recording temperature. The FieldLogger 512k is a self-sufficient data acquisition system for temperature recording. The device has 8 analog and 8 digital inputs. The RS485-interface can be used as master/slave modbus RTU. As "master" the FieldLogger is able to read and record up to 64 external channels. The measured values, which fit according to the inputs, can be processed with mathematical methods. The device distuingishes itself by its large internal memory and can be equipped with a SD-card, if further memory is needed.